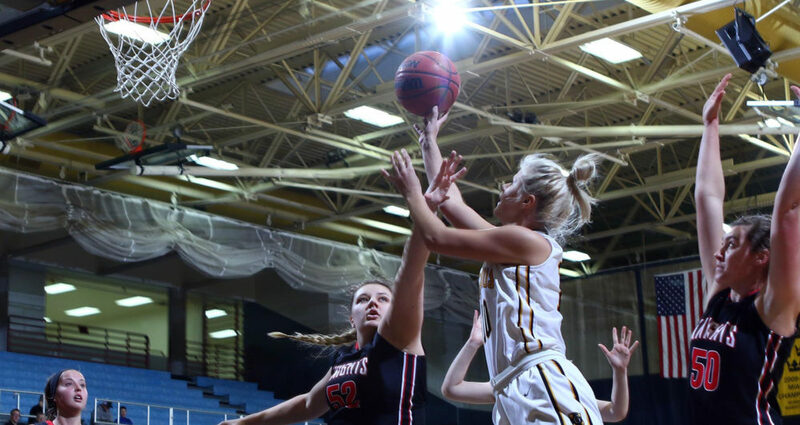 SAINT PETER, Minn. – The Gustavus women’s basketball team posted a second straight convincing victory on Saturday afternoon, defeating Martin Luther 87-46 to improve to 2-1. The Gusties shot well at 55 percent from the field, including 50 percent from the three-point line. The home team also forced 25 turnovers with 17 steals. Justine Lee (Sr., Dawson, Minn.) led Gustavus with 13 points, shooting 5-for-6 with three treys. She also tallied three assists and two steals. Kendall Thompson (Sr., Eden Prairie, Minn.) and Gabby Bowlin (So., Winona, Minn.) reached double figures as well with 12 and 10 points, respectively. Maddie Wagner (So., New Richland, Minn.) led the team off the bench with nine points, five rebounds, and three steals. After three minutes of trading buckets to start the game, the Gusties went on a 25-4 run to close out the first quarter and never looked back. Eighteen players got in the game with 12 players scoring points. Gustavus next hosts Buena Vista at 7 p.m. Tuesday.